Rent a 2019 Pecan Tree! Nestled in the backwater plains of Georgia is a superb grove of pecan trees that has been part of a family farm since 1870. After years of cross-breeding the best of the native pecans, this orchard has developed its own species to produce 50% more nutmeat than non-cultivated varieties. Each mammoth pecan is hand-selected for top-notch flavor, freshness and texture. 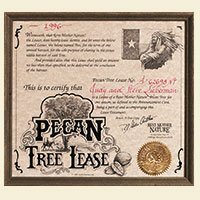 Rent a pecan tree for someone who would like pecans from their own tree. The Lease Document is calligraphed with the recipient’s name, and comes with an Announcement Card explaining the program. Periodic Progress Reports provide facts, anecdotes and folklore about the grove. Treat a friend to pecans from their own pecan tree on a Georgia family farm. These majestic trees, after years of cross-breeding, produce pecans with 50% more nutmeat than uncultivated trees. We guarantee at least 3 pounds of natural, fresh pecans, hand-selected for superior flavor & texture. We loved this gift! Very clever. Save the trees! This is a wonderful gift. I’ll be using the pecans all year long.